Detail of Untitled [Sumizome 1] by Masako Kikuchi. In February last year, I moved to Kyoto. I wasn’t sure exactly how long I’d be here, but I intended to spend as much time as I could immersing myself in the world of Japanese textiles. As a textile designer, I arrived with a fundamental understanding of the more well-known techniques – shibori, katazome, kasuri, indigo dyeing, all of which are carried out here in the country’s historical textile capital. I was familiar with these methods, but during my stay I was hoping to learn more than just technical know-how. What I really wanted to know was the “why”—to gain a deeper understanding of what lies beneath the surface of Japan’s rich textile traditions. Kyoto is a city of living tradition. It didn’t take me long to discover a world of artisan kinship, with a carefully chronicled and overflowing knowledge of its crafts. Reference books and artists’ catalogues burst with extensively documented histories, detailed instructions, recipes and footnotes, with words I’d never heard before for techniques I never knew existed. I was overwhelmed by the sheer volume of thought and process. As I spoke with practitioners, something beyond technical instructions and hierarchical tutelage gradually revealed itself to me. Something that seemed to be a central characteristic of these crafts. It was the dedication. I began to understand the significance of personal philosophy and spirituality not only in textiles, but in all traditional arts—from the tea ceremony to Nō theatre, from ceramics to calligraphy. They all share a common set of aesthetic virtues: austerity, elegance, a sense of natural beauty. There is a profound influence of Zen Buddhism on Japanese aesthetics, and understanding that effect helped me grasp the complexities of textiles and heritage craft in Japan. With a greater awareness of the philosophical motivations behind textile making, I was keen to see how and where traditional techniques were being brought into contemporary use. What does it take for these methods to thrive in a world reluctant to loosen its dependence on mass-production? What does their future look like? In searching for these answers I discovered a small group of textile makers who are uniquely interpreting and adapting traditional skills to our changing world. Their techniques are many and varied – natural dyeing, printing, weaving, upcycling and clothing design – but what connects them is a respect for natural materials and the enthusiasm to revitalise age-old practices. This is the conviction that has driven my research here, and one which led to the evolution of an exhibition: The Intuitive Thread: New Expressions in Japanese Textiles. The Intuitive Thread exhibition at The Japan Foundation, Sydney. The four artists presented in The Intuitive Thread re-interpret traditional textile methods in a contemporary context. Their works represent a commitment to an enduring, living Japanese aesthetic, where beauty emerges not just from the self but from an unwavering dedication to process. It may not be obvious on first glance, but Japanese aesthetics is deeply concerned with the beauty of the everyday. Practitioners of traditional methods create objects that place equal importance on high art virtue as they do on the necessities of daily life, and virtually inextricable from our daily lives is the presence of textiles. The role of textiles hasn’t changed much since we first began making them thousands of years ago. We associate cloth with routine and the fundamental requirements of existence. It is our clothing, protection and privacy. It engages with our senses, particularly our haptic perception. It is also a way for us to communicate and a conduit by which we express our identity. Therefore, when textiles become artistic objects observed in a gallery space, they don’t lose their connection to the everyday. Their perceived value may be higher but their characteristics remain implicitly familiar to us. We know cotton is sturdy and practical, wool will keep us warm, and silk is symbolic of elegance and luxury. In considering textiles as an artform we also call on our existing knowledge of how and why we use cloth. To some extent, we have already been briefed on the science, history and culture of textiles. These relationships dismantle the divide we often create between “high” and “low” artforms. 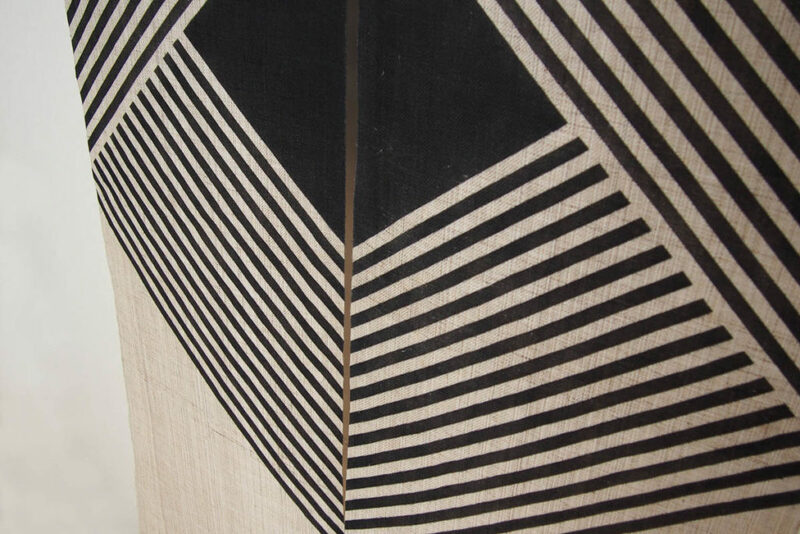 It is in finding this balance between the elegant and the commonplace that traditional Japanese textiles excel. An object wrapped up perfectly in a decorated furoshiki cloth can elevate the act of gift-giving. The silk lining of a kimono, dyed to both complement and contrast the elaborate exterior, occasionally exposed as the wearer moves and walks. The noren, a traditional doorway curtain, does far more than just its original task of protecting homes from the elements and advertising a shop’s wares. They are colourful and curious conversation-starters, representing anything from family heritage to the beauty of the seasons with bold and graphic prints. With traditional techniques like weaving, dyeing and printing, artists are able to transform everyday objects, giving them beauty and significance beyond their original function. Japan’s traditional arts go back centuries. While many skills and customs have fallen into decline in favour of modern mass-production, handcrafted textiles remain firmly grounded in the slow, disciplined and often laborious processes required to create them. As I discovered on visiting small textile production studios in Kyoto, brand new technology is seldom to be found. Machine automation has been slow to impact these crafts, and makers still rely on the availability of raw natural materials as their primary resource. Traditional textile techniques are directed by materials above all else. They are skills tied to land, climate and custom. Their practitioners are less concerned with new developments in technology than they are with an instinctive understanding of natural phenomena. Sōetsu Yanagi, founder of the Mingei folkcraft movement, wrote at length about the characteristics of Japan’s traditional arts and why we need instinct over intellect if we want to understand real beauty. He believed that to truly appreciate a designed object it is necessary to discard your ego and become receptive, unattached and acquiescent. In Zen teachings, this is a state referred to as mushin. Whether implicit or explicit, most of us go about our lives on a quiet pursuit of meaning. For followers of Zen, attaining enlightenment is seen as the utmost spiritual goal and Japan has grounded its artistic pursuits in this type of spiritual quest for centuries. Reaching this “no mind” state means rejecting learned assumptions and desires. This includes how we understand beauty. In The Unknown Craftsman: A Japanese Insight into Beauty, Sōetsu explains that once you release yourself from the desire to attach your ego to an object, you lose any distinction between yourself and that object—‘the opposition between that which sees and that which is seen [is] dissipated’ (Yanagi, 1989). We no longer see a distinction between what is “beautiful” and “ugly”. For that reason, the artist doesn’t need to force an outcome to fit an imagined ideal of beauty—instead they should yield to the process that gets them there. The creation of textiles is a commitment to process over product; to cultivating the self instead of being self-expressive. The handmade textile process requires that we temporarily abandon our vision of the final designed object in order to give ourselves over to the meticulous nature of constructing cloth. For a textile practitioner, the diligence required during the process is what gradually reveals one’s individual character. When the finished object emerges, it is a moment of clarity, expression and recognition. 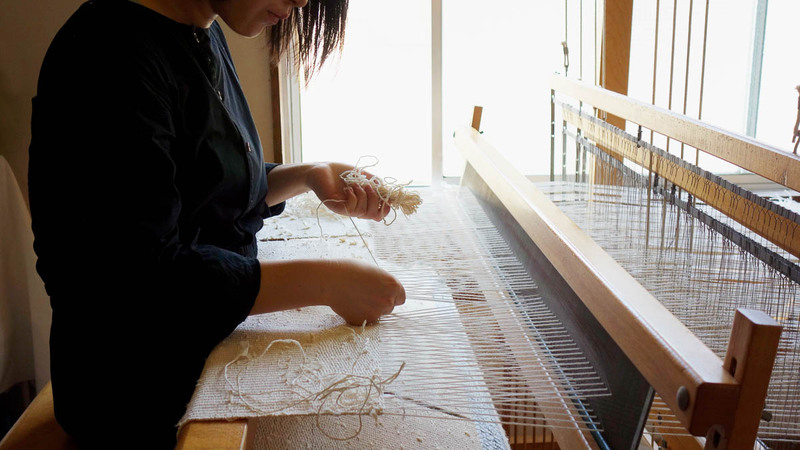 Misako Nakahira working at her loom. Kawai Kanjiro, artist and key exponent of the Mingei movement, said “the unknown self is revealed through the work of the hands and the body” (Uchida, 1973). This philosophy deeply resonated with me in considering textiles. As a textile artist manipulates their materials, the mind and body are engaged in a state of instinctive equilibrium. Memorization gives way to intuition. Tools lose their status as inanimate objects and become extensions of the artist’s body, able to anticipate changes in movement, tension and range. Weaving is a perfect example of this. 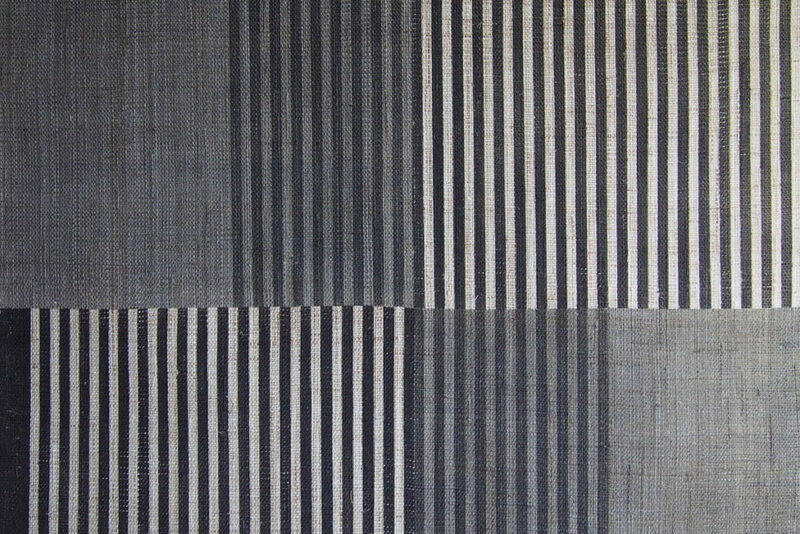 There is a truly harmonious quality to creating woven textiles by hand as the artist is forced to acknowledge the natural pliancy and tension of the fibre, adjusting their movements and bearing until the process aligns with the natural rhythm of the body. The cadence of intersecting warp and weft threads is like a steady drumming heartbeat. Your breathing starts to match the raising and lowering of foot pedals. A pause to release the warp tension is a deep exhale. When these mechanic movements become attuned to our natural rhythms, the self falls away and the process is revealed. In the work of weaver Misako Nakahira, the combination of raw natural materials like paper, cotton and flax in undulating, organic patterns distinctly reveals her process. She chooses materials by the tactile connection they have to daily life, and her recent works have had a particular focus on Japanese washi paper. Woven washi cloth or shifu played a role in traditional Japanese dress for centuries as its strong, lightweight and insulating properties made it perfect for cold-weather protection. In contrast to contemporary preoccupations with speed and efficiency, something so seemingly fragile and antiquated as paper thread would rarely be considered for its functional properties. 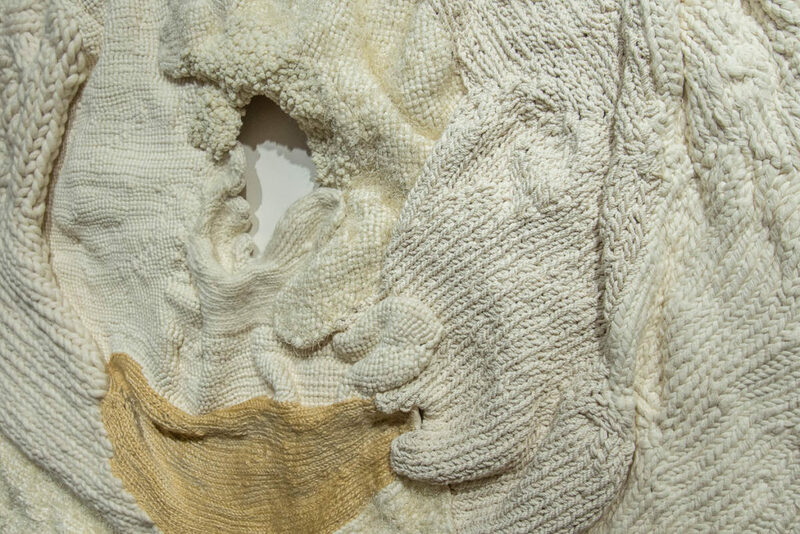 Nakahira seeks to bridge this gap, creating a new form of textile which both honours the artisanal ingenuity of the past and explores the future potential of traditional materials. Detail of Touch Sense, Evoke Subconsciousness by Misako Nakahira. When looking at textile methodologies with ancient origins, I find there are few as deeply connected to the earth and ancestral experience as natural dyeing. When Kanjiro discussed his preference for natural pigments over synthetic, he referred to nature as “the science that precedes all science.” Natural dyeing predates recorded human history. The first known traces of plant-stained material are over 10,000 years old. Humans discovered very early on how to extract colour from their environment. As we evolved, developing more and more sophisticated methods of material augmentation, the processes behind this prehistoric technology remained relatively unchanged. In natural dyeing, instinct can operate independent of technology. Natural colours are susceptible to atmospheric and elemental forces: fluctuations in ambient temperature, light, the hardness of tap water, acidity or alkalinity. Through calculated intuition, the dyer is able to both manage the process and leave things open to chance. Chiharu Ohgomori is an artist who engages with these natural phenomena. 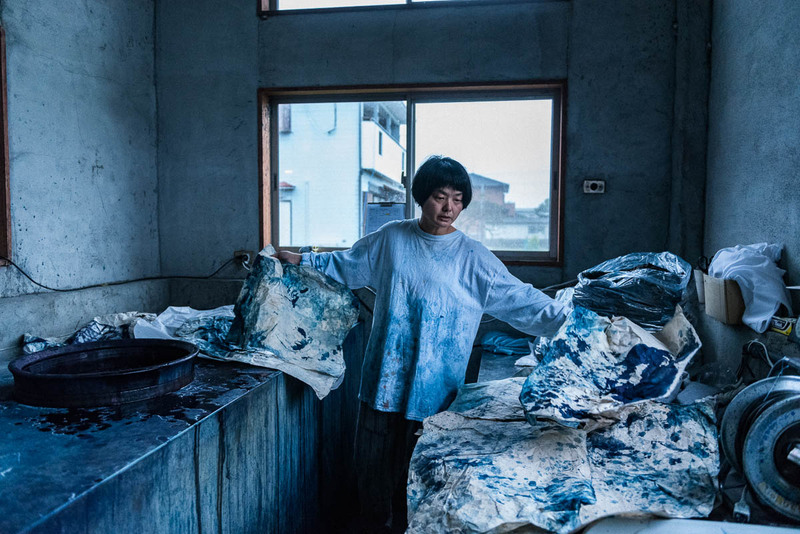 In her studio, Takarajima Senkou, she explores how natural dyes can bring out rich, pure colours in ways that synthetic pigments cannot equal. Using indigo, mud, ink and other raw plant materials, she employs shibori methods and freestyle staining to create patterns that are poetic and considered, enhancing the beauty of her naturally-derived colours. She immerses the cloth in a dye bath several times, building the hue layer upon layer to produce unique shades of colour. When these textiles are fashioned into clothing and interior objects, an ancient technique gains contemporary relevance and becomes part of our everyday lives. Chiharu Ohgomori working in her studio. The dyeing process is a kind of ongoing conversation between the maker and their materials. Natural colour doesn’t have a fixed outcome. It is fluid and can continually be modified and experimented with. Every subtle change in hue is unexplored territory, a chance for the artist to either control or concede to the proclivities of their materials. Few other textile techniques can so effectively express one’s temperament. The artist in a light-hearted or whimsical mood may dye their cloth spontaneously, producing effervescent colours and energetic patterns. In a different mood, they may choose to dip their cloth multiple times into a dark, turbid indigo vat, seeking a rich and complex depth of colour. These expressions of self are not mutually exclusive, though. A textile artist who works with dye will often move between many techniques, skillfully combining processes of experimental and learned knowledge. Masako Kikuchi interprets the world in monochrome using a unique dyeing method known as sumizome. A combination of the words sumi (black ink commonly used in calligraphy and traditional painting) and some (the Japanese word for dyeing), she expresses her visual concepts using only raw flax cloth and a single pigment—black, the absence of colour. From what may seem like a limited coupling of materials, Kikuchi is able to draw out shades that gives weight to her finely detailed and mathematical patterns. Her rhythmic, defined lines explore the full potential of sumi ink to create depth, elegantly shifting between a remarkable range of shades. Kikuchi also recognises a place for her art to exist in our daily lives. The woven flax cloth she works on provides the perfect canvas for her sumi tones with the added bonus of being one of nature’s strongest fibres. Made into functional items such as bags and tableware, her work assumes a practical purpose beyond its aesthetic virtue. The results are objects that are truly worth using and treasuring. Detail of Untitled [Sumizome Noren] by Masako Kikuchi. Followers of Shinto believe that deities called kami reside in all natural objects—from rocks and trees to mountains and rivers. Everything is drawn from the same spiritual fabric, and thus humans share a metaphysical bond with all material things. Therefore, an object showing signs of wear and ageing can hold as much (or even more) value as something new. In Japanese folklore, tools that have been used for over 100 years are said to inhabit a spirit, transcending their material form to become tsukumogami or “tool kami”. This kind of belief can help us gain a deeper respect for all that exists in our physical world. There is no better example of these spiritual influences on the traditional arts in Japan than the commitment to repairing and reworking to give new life to an object. This constructive approach to making is tied to the concept of mottainai. A notion which emphasises the value of reuse and resourcefulness, it also conveys a sense of regret at the thought of wasting something. One of the most well-known examples is kintsugi, a method of repairing chipped or broken ceramics with gold-infused lacquer. Using this process transforms a defect into a point of beauty, proudly displays the object’s history. Kawaradobei are mud walls that are composed of broken roof tiles arranged in careful patterns, giving the wall both structural support and a decorative touch through practical reuse. When it comes to textiles, the beauty of gradual wear and decay is also celebrated with a traditional method of repair known as boro. Named for the mimetic boroboro meaning threadbare and tattered, boro aims to extend the life of textiles instead of replacing them. This former working-class method for mending clothes and home goods has found contemporary relevance in the work of clothing label Sasaki Yohinten. 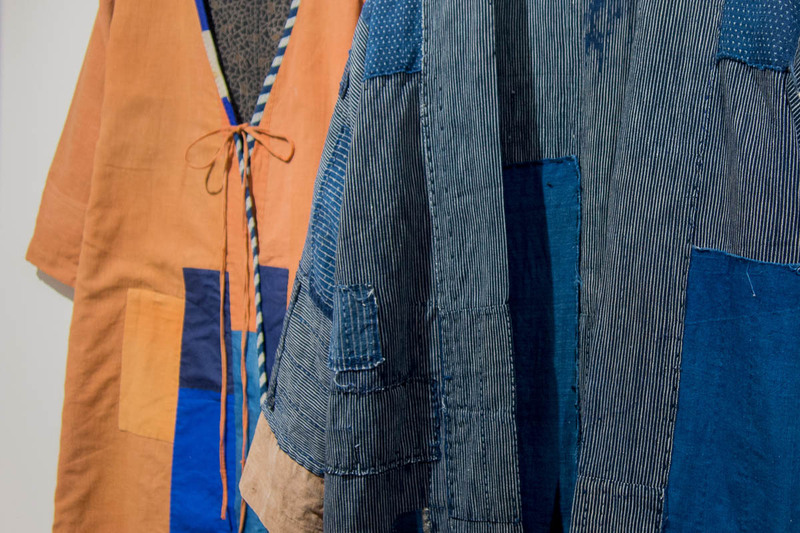 Using boro’s distinctive scattered patching and strengthening hand-stitch techniques, designer Chiho Sasaki reworks antique clothes and textiles into new garments. She cherishes the signs of a life well-worn. 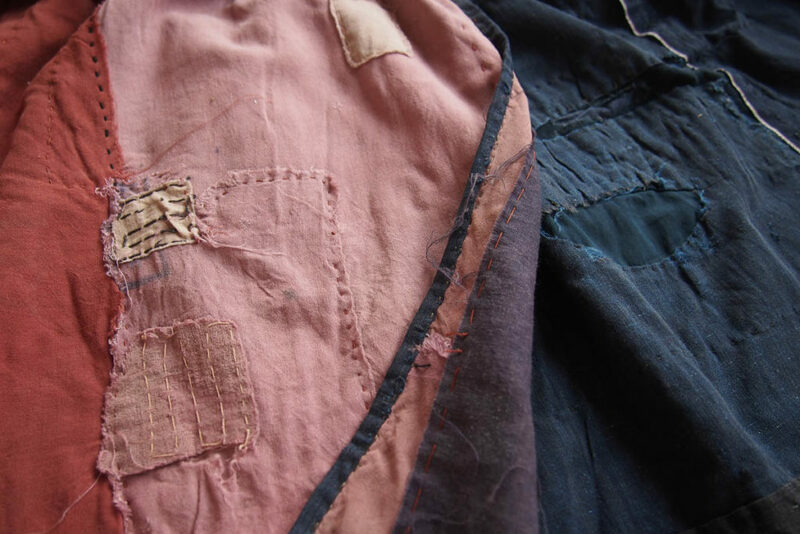 Colours are faded, patches left frayed, stitch lines exposed. Each garment is repurposed to be perfectly wearable without concealing the visible history of the cloth. The conscious act of mending and remaking also recognises the impermanence of all things, a Zen teaching that often finds its way into ideas of aesthetic beauty among the Japanese arts. In Yoshida Kenkō’s famed Essays in Idleness, he recounts a conversation he had with Ton’a, a renowned Buddhist poet and scholar. Ton’a, upon hearing from another man that thin silk was too weak to use in a scroll, remarked “It is only after the silk wrapper has frayed at top and bottom, and the mother-of-pearl has fallen from the roller, that a scroll looks beautiful” (Kenkō, 1998). To accept a cloth with signs of decay and natural flaws is to accept an object as beautiful in its present state, knowing that all things in life are transient. Detail of Boro Apron by Sasaki Yohinten. As consumers of modern day textiles, we are struggling to justify how they are produced. We are aware of the risks that fast fashion poses on the environment and human rights. Textile mills, like many other industries of material production, are manufacturing at scales that are anything but sustainable. It’s not an exaggeration to say we face a crisis – but crisis begets opportunity. In reckoning with how we got to this point, we have an opportunity to look closely at what went before us. Traditional methods of textile creation may seem like a quaint memory of a pre-industrial world, but returning to these environmentally and culturally sensitive skills can provide us with a crucial insight into our current habits. Slowing down our making can guide us into a more humane and receptive appreciation of the world. By delving deeper into these traditional methods, observing their role in contemporary artistic practice, it became clear to me that philosophies of making from the past are as relevant now as they ever have been. They are pivotal in formulating attitudes about our material future. 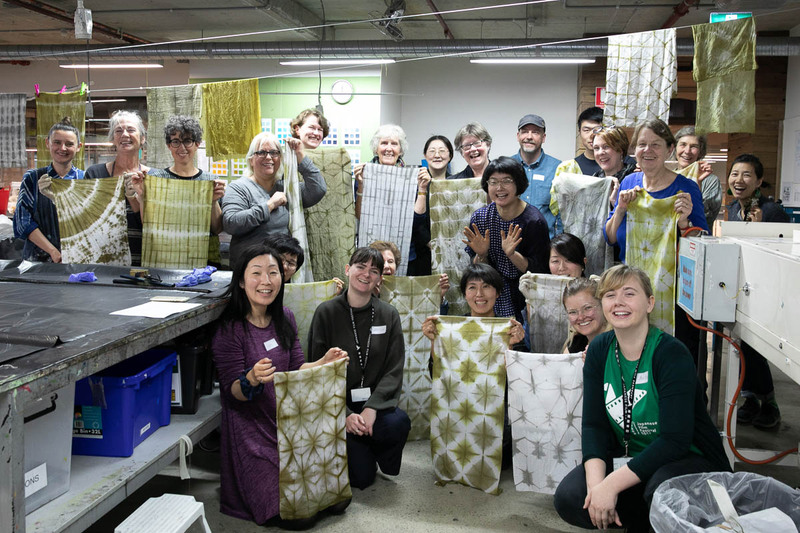 Natural dye workshop with Takarajima Senkou at the Japan Foundation, Sydney. Hisamatsu, Shin’ichi (2012), An Introduction To Hisamatsu Shin’ichi’s Religious Thought. Translated and edited by Tokiwa Gishin and Tsukui Akemi. 1st ed. [ebook] Kyoto: The F.A..S. Society, p.83. Available at [Accessed 25 July 2018] Saito, Yuriko (2017) ‘Historical Overview of Japanese Aesthetics’, in Nguyen, Minh (ed.) New Essays in Japanese Aesthetics. Lanham: Lexington Books.Carter, Robert E. (2017) ‘A Philosophic Grounding for Japanese Aesthetics’, in Nguyen, Minh (ed.) New Essays in Japanese Aesthetics. Lanham: Lexington Books. Uchida, Yoshiko (1973), We Do Not Work Alone: The Thoughts of Kanjiro Kawai. Second Edition. Kyoto: Kawai Kanjiro’s House. 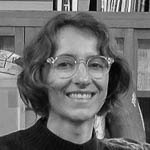 Eloise Rapp is an Australian designer, researcher and educator specialising in textile design. She worked in the Sydney and Melbourne fashion industry for eight years before turning to independent research and consultation, focussing on education, sustainability and community development. Eloise has lectured in the fashion and textile program at Sydney’s University of Technology and at Vantan Design Institute in Tokyo. 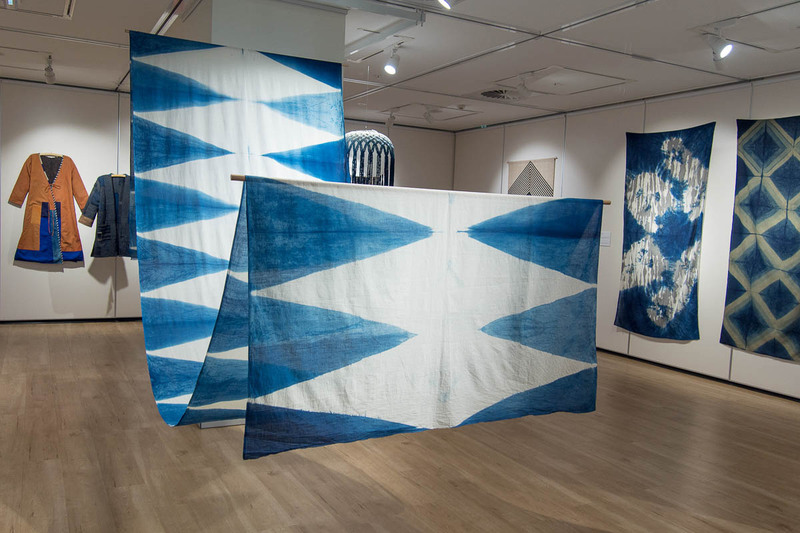 At UTS she developed a new textile print subject for the Masters of Design program and, most recently, she curated The Intuitive Thread; an exhibition of contemporary textiles at The Japan Foundation in Sydney. Eloise regularly works with fashion social enterprise The Social Outfit on product design and creative direction. A lifelong admirer of Japanese textiles, she has just finished a year of research and study in Kyoto and will spend next year researching and making in Tainan, Taiwan. Fantastic article with in depth explanations. Thanks you for sharing! Thanks for writing. It was good to read about this in relation to fiber. Thank you for your thoughtful article. I agree wholeheartedly with your comments regarding the need for current practices in the textile industry to change. The attitude of consumers also needs to change to acknowledge the harm that ‘fast fashion’ is doing to our planet at present. I am an indigo dyer and love everything about the process. I am absolutely lost in the act of dyeing and find deep meditation there as well as that childlike anticipation of unwrapping as I never completely know what I will find. I have just found Garland and am looking forward to future essays.